From the other side of the mirror. And sing my sorrow-song to her. And be the blotting paper to my pain. This poem is about a girl's friendship with the moon. I believe if we can befriend nature, we can discover a mine of treasure and wisdom within us. At times of despair, gazing at a sunset or moon can provide more solace than talking to someone. 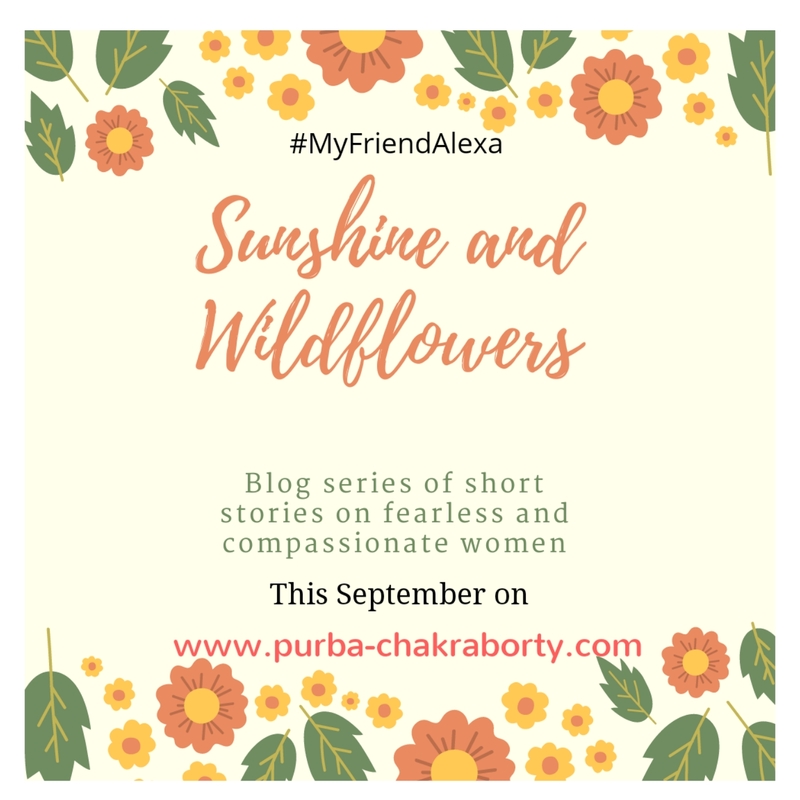 Although Sunshine and Wildflowers is a blog series of short stories on women, I thought of also using poetry as a tool for story-telling. Should we befriend nature, we would live a richer life. Such a lovely lovely poem Purba. Storytelling through the art of poetry is truly magically. I agree if we can make friendship with the beauty and bounty of nature we are an elevated soul and we nurturing our senses with unbound joy and bliss. Moon has its own personality though it get its shine from someone else. The brightness in the backdrop of contrasting darkness unfolds a mythical environment for us to explore and engage in a whole new world. The relationship is not just between living creatures but the relationship we as human being associate with nonliving things makes life so beautiful. There is life everywhere, it is just that we don't know how to communicate and associate with some living and most non living thing. Just take a case of pet animals and there is not the conventional language in play but the love of caring and sharing makes it simply a wonderful relationship. Great to land here and enjoyed reading your lovely thoughts. Lovely poem and reflection of thoughts. "At times of despair, gazing at a sunset or moon can provide more solace than talking to someone. "- Couldn't agree more. The poem is so poignant. You're much talented. Very nice poem, yes we can get life lessons from moon, that starts anew after dark nights and again with his brightness, makes the whole world shin. Yes we have to embrace our emptiness and rise again from time to time. 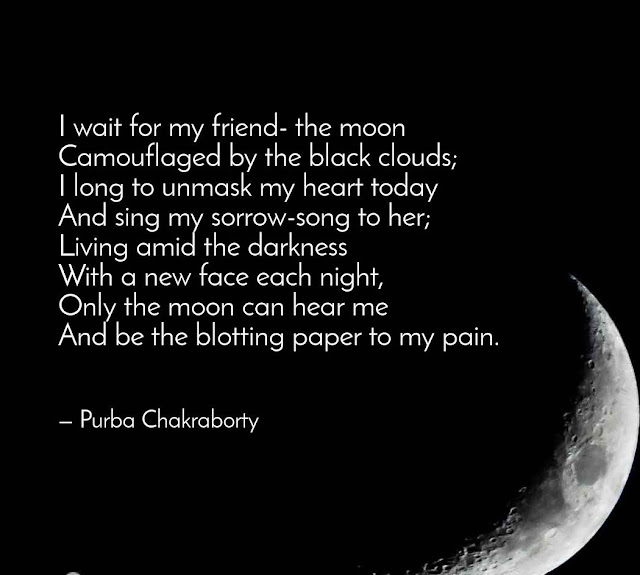 What a beautiful poem this is Purba! This love for moon is so palpable in these lines. To make friends with Nature is the simple — yet transformative — idea that if we treat the natural world as we would like to be treated, like a friend, then it will treat us kindly in return. That's beautiful and its true sometimes talking to nature is better than talking to a person. Loved it. This is beautiful, Purba. Liked the relationship of the girl and the moon. Have always loved your poetry. This one's equally beautiful. Moon as the blotting paper for the pain and the sole audience for the deluge of emotions is a great perspective! Agree you that going closer to nature, one finds solution to every challenge in life. A lovely presentation of befriending nature. And, a great thought actually. Nature would be silent friend, always there for you and never judging. A friend 'Moon' who shares all the sorrows....beautiful lines! I find solace in the sky or the sunset. It's my way of getting in touch with nature! If we ponder, nature has a lot to teach us. The full moon to the waning one is so beautifully expressed through the words "In order to start anew, embrace the emptiness." It speaks of hope and a feeling of fulfilment after acceptance.That's deep. A well penned poetry! I loved it! Very beautiful message given in a beautiful poem .. This line stayed with me for a long time. Moon governs our emotions according to Vedic astrology. It can indeed act as the blotting paper and remove all stains of pain and be a balm to an aching heart. Beautifully written, Purba! Moon has been always in our life in different ways. Lovely poem Purba. Moon as blotting paper of pain; this line is going to stay with me. Such an emotional one! I felt as if I shared a part of me with the moon! I wondered how long it has been since I gazed at one lying in the terrace!! Resonates well! Such beautiful thoughts. Story-telling in form of poem is skill. Very well written. Love the blotting paper line. And sing my sorrow-song to her. " got me glued I read and re-read because I loved how you conveyed emotions, friendship with moon and presentation. Beautiful way of story telling through poetry Purba. We can learn a lot from nature. Sun, mooon, birds, are all very inspiring. Moon comes back from darkness, shines brightly and spreads light everywhere. Beautiful this. And yes nature has a wonderful way of calming the nerves. That's the effect staring at the sea has on me. Amazing and beautiful post. Beautifully expressed the thoughts. We are our best self when with Nature. It inspires like No one. Good Post. During all my hostel life, the moon was my companion. In my sorrow, my joy, my helplessness, the moon was my first confidaco. Loved reading your poem. It's so true! Thats a lovely poem. I can relate to many parts in it. Deep and meaningful. Such a beautiful post and loved how wonderfully thoughts are expressed. Beautiful lines! Moon is always companion of many...forever! Poem is beautiful. I agree that sometimes connecting to nature inspires us and it can be our friend too. A beautiful poem. Nature is the biggest treasure. These are some lovely lines. Nature is inspiring and healing! Beautifully written...For me the waves at the beach seems to be the most soothing part of the nature..
LOVEDDD YOUR POEM Purba...tooo good ...SUPERB!!! Such a lovely Poem Purba. Loved reading it!